Dr. Sarah Wyatt waited for it—the simple phrase that would signal one small step for Arabidopsis, one big step for mankind’s knowledge of how plants respond to gravity. “Ready for the science,” said the Kennedy Space Center engineer on July 9. Dr. Darren Luesse handed the engineer a small petri dish with Arabidopsis thaliana seeds while Wyatt filmed and narrated on her iPhone. Just as NASA runs astronauts through training and testing in Houston, the Kennedy Space Center runs Wyatt and Luesse through extensive preparation for sending their experiment to the International Space Station, a flight expected this winter. Wyatt is Professor of Environmental & Plant Biology at Ohio University. 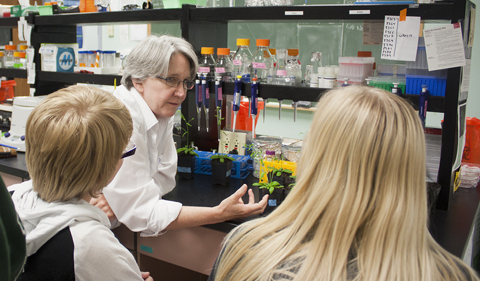 Luesse is Associate Professor of Biological Sciences at Southern Illinois University. Arabidopsis thaliana is a small flowering plant native to Eurasia. Arabidopsis has one of the smallest genomes of any plant and was the first plant genome to be fully sequenced. It’s also tiny, which means the petri dish in Wyatt’s video contains 800 seeds. For this phase of the testing, the seeds aren’t headed to space. This is an important dress rehearsal at the Kennedy Space Life Sciences Laboratory. The researchers are running the experiment exactly as they would on preparation for the launch. A simple text from Wyatt to the communications director of Ohio University’s College of Arts & Sciences last summer. A little anthropomorphism can be expected for a scientist who as a young girl in Kentucky sat glued to the TV as NASA engineers announced “the Eagle has landed” and Ohioan Neil Armstrong stepped onto the moon. 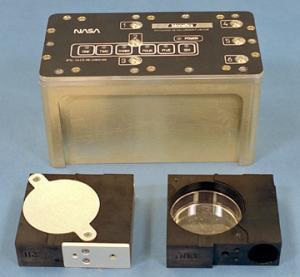 And, appropriately, the module that will receive Wyatt’s experiment on the International Space Station is—Destiny. The Destiny Module aboard the International Space Station is a state-of-the-art microgravity research facility and the primary operating facility for U.S. research payloads. The Destiny Module is where the Wyatt Lab Arabidopsis seeds will spend their time in orbit. The lab was built by the Boeing Company and launched into space in 2001 aboard Space Shuttle Atlantis. In the Wyatt-Luesse experiment, Arabidopsis seeds germinate on sterile petri dishes for 72 hours before being “fixed” with RNAlater to halt germination. The plates are placed in petri dish fixture units called PDFUs. The PDFUs are loaded into the BRIC (which can hold up to six PDFUs) and then sealed. Watch the A&S Forum as the test petri dishes return to Ohio University to be thawed and tested.